We got up early morning for our trains to Takayama. These weren’t shinkansens or even limited express, they were local trains or futsu’s that took us across some really scenic countryside. The train was full of school kids on their way to school, constantly on the phone, a bag on their back and an umbrella. We had to switch at a small station called Inotani and this was a proper small town. Most of the kids had gotten off way before Inotani. We were getting closer to the mountains where the station was just one track with only a cabin as waiting room. As soon as I got off at the Inotani station, I couldn’t stop smiling. Till the previous night, Japan still hadn’t sunk in. Sure the 7-eleven magazines, screaming game shows on tv and asahi had happened, but still. Just look at the images. The overcast skies, the mist/clouds, the small patches of farms. I’m from a small town and I’ve spent a lot of times in train or in stations, and I’m glad the trip started this way. Cities have their comfort which enslave us, but the mountains, their charm frees us. Noticed this often in Japan. In India, when there are farms, it's usually in stretches, large portions I mean. But with Japan, I think a lot of people have their own produce. They have small farms even between houses. Pretty interesting. Some years ago, a friend had asked me “are you a mountain-person or a beach-person?” Till then, I didn’t even know the phrase “mountain-person” or “beach-person.” 2015 has been the year of mountains for me – the Himalayas, Ooty (for the nth time) and Japan and I’ve LOVED it. The connection train slowly took us up slopes, with the scenery changing from farms to just mountain slopes freshly painted green with the previous night’s shower. The sun was out and we could see the fog dissipating at some of the mountain tops. We reached Takayama close to 10.30ish and straight headed for a brunch of Beef sushi, Beef curry and Ramen (don’t worry, pics are below to satisfy your visual palette). I’d planned on seeing Sannomachi in Takayama before heading out to Kamikochi or Shin-hotaka ropeway. So we walked to the heritage street only to find it CROWDED. I’d thought like a tourist and found my brethren in hordes. We had a quick look and moved to the Kamikochi Jinya. I recommend making a 15 min stop here. The Jinya is a security outpost which has a lot of relics, a pristinely maintained katana blade, the armor passed on for generations of the security officer and a rice storage room that has been preserved immaculately that the smell is distinctly that of rice and straw. I swear I wasn't being nosy. Sannomachi street in Takayama. That's Francis' frustrated face when I stop him from eating for photos. Beef curry (moi), Beef sushi (share) and Ramen (Francis). The bus stop to Kamikochi was right beside the station. Shin hotaka ropeway got pushed to the next day coz of bus schedule. So we left for Kamikochi for which we had to switch buses at Hikari. The scenery got warmer and more colorful as we went. Especially since the route had so many tunnels, we would be in the dark for quite some time and then be unveiled to the trees slowly turning color to yellow and orange with the onset of autumn. Then darkness again, more yellow and orange. This was till Kamikochi. Buses from Takayama head out straight to Hikari where you need to change for Shin-Hotaka or Kamikochi. Kamikochi is a base camp set against the backdrop of the Hotaka mountain range. A river runs right through the small town and has a bunch of backpacker’s inn + souvenir stores on either side of it. We just dropped our bags and went for the nearest store before it shut at 6.30pm. Bought a bottle of cold sake, some bites and a couple of paper cups. 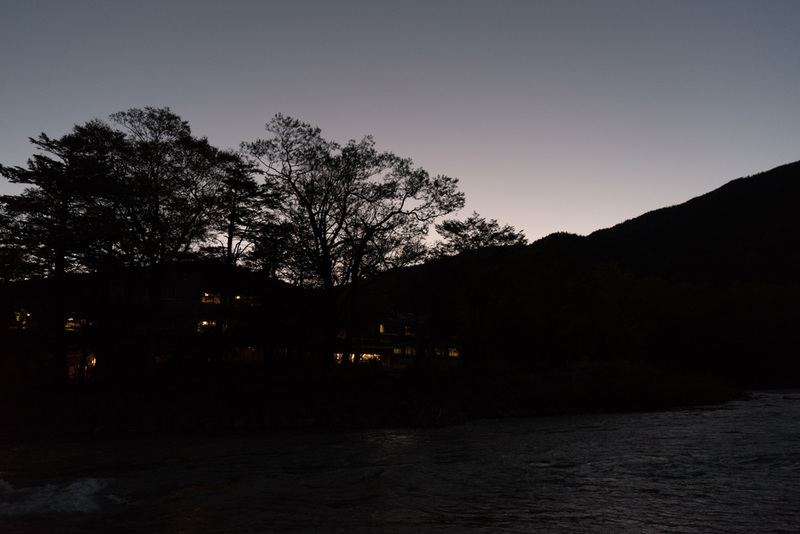 Settled by the side of the river, propped the bottle between some rocks in the river (temperature was getting cold) and started drinking sake till only the mountain tops were lit golden by the sun while we were in the dark. We sat there till the trees formed silhouettes against the backdrop of the purple sky and headed out to the dinner at around 7.30. The cabin had a dining room and a rec room, with a central heater. 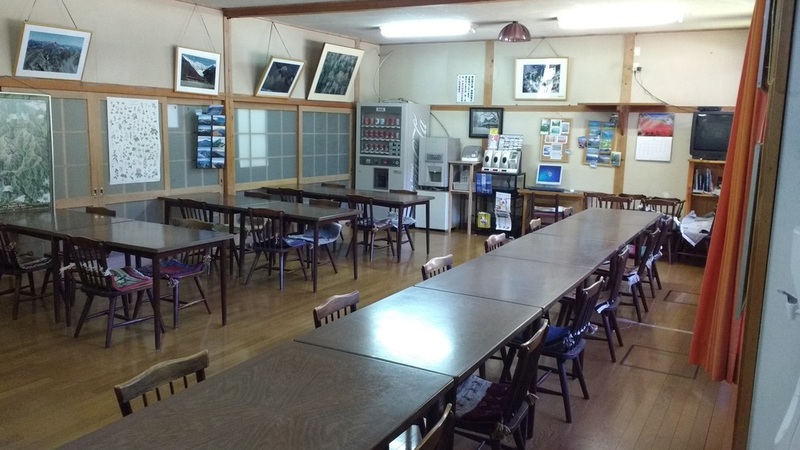 The dinner was all laid out on the table (again photos included) with an electric cooker on each table that had hot rice and flasks with hot tea and miso soup. Fellow travelers started pouring the hot tea for us as we settled in. We sat in the rec room after dinner catching up on a bunch of things. More than two people came upto us for a friendly chat without even knowing English. A big group in their late 60’s or above were travelling together and a gentleman from the group came over for a chat. It was a conversation of smiles, sign language and more smiles but the genuine-ness of it couldn’t be mistaken. This is common for the mountains, the friendly banter. We hit the bed around 11pm for an early morning walk to a nearby pond (3.5kms from our inn) called the Myojin pond. Ample portion of food. Doesn't look enough but by the time you're done with it, you know it's sufficient. when we were trying to get to Kamikochi we called it's Tourist Information centre (coz the hotel folks didn't know english absolutely) from Takayama. They asked us to call back in 10 mins and confirmed that there is availability. Following which we just had to call the inn and confirm number of people and name.